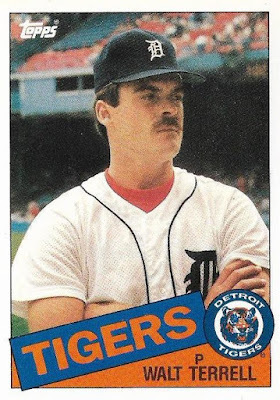 What a card: This is the 29th rookie card in the 1985 Topps Traded set. 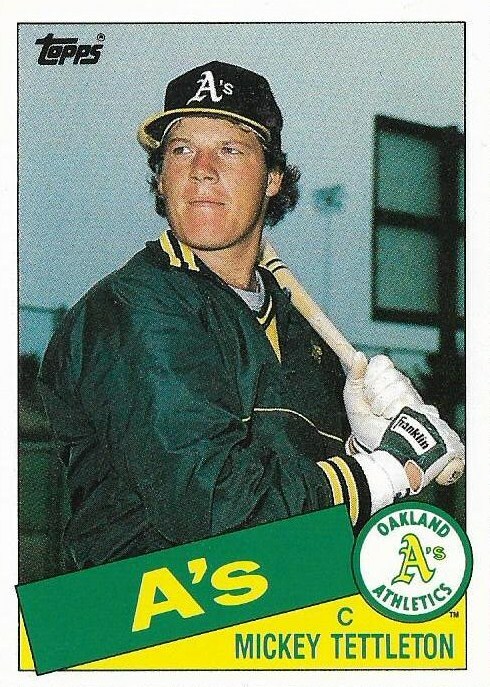 Tettleton played in 78 games for the A's in 1985, but the future power-hitter hit just three home runs in 211 at-bats. My observation on the front: That appears to be the back of a scoreboard in the background of the photo. You don't see that a lot on cards. 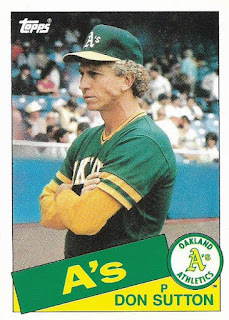 More opinion from me: It's just now occurring to me that if this design was made today, the "A's" would be spelled out as "ATHLETICS" and how terrible that would look. 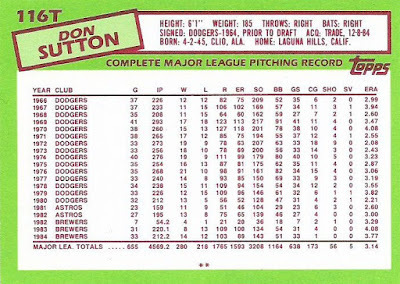 Something you might know: Tettleton was fond of Fruit Loops cereal and his food choice became so popular that fans would send him boxes of the cereal to sign. 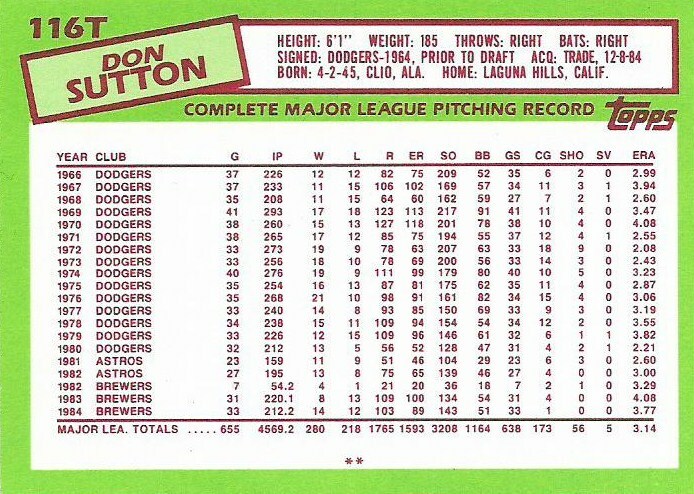 Something you might not know: Tettleton once held the record for most strikeouts in a season by a switch hitter with 160 in 1990. 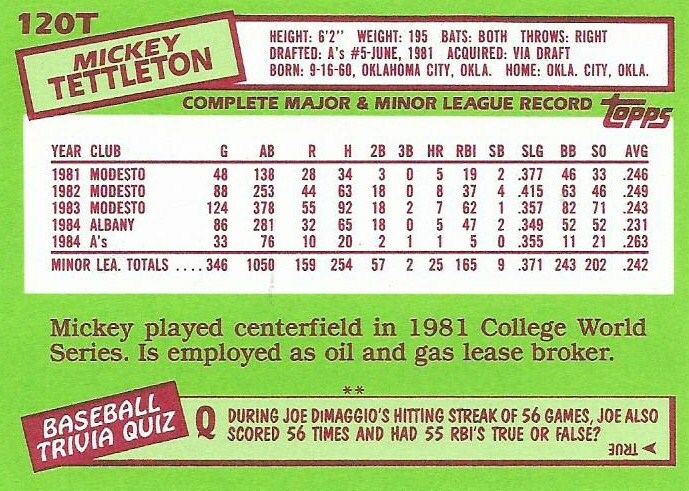 That record is now 217, set just last year by the White Sox's Yoan Moncada. 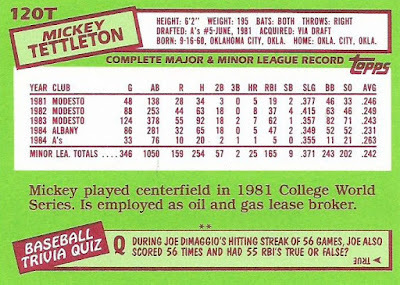 My observation on the back: Tettleton was named after Mickey Mantle. Both are Oklahoma natives. 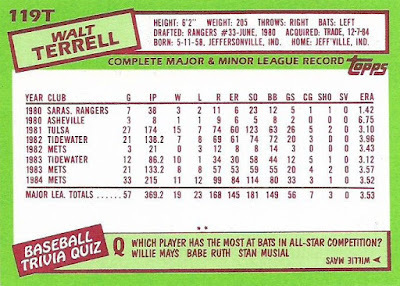 Maybe pick a Mantle trivia question? 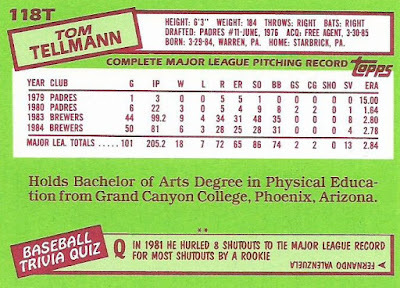 What a card: Tom Tellmann was signed as a free agent by the Oakland A's on April 11, 1985, two weeks after being released by the Brewers. 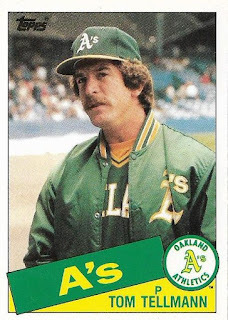 How'd that go: Tellmann's MLB career ended in 1985 with just 11 games pitched for Oakland and a 5.06 ERA. In fact, I'm a bit surprised Topps made a Traded card of Tellmann as he didn't have an appearance for the A's in '85 beyond June 2. 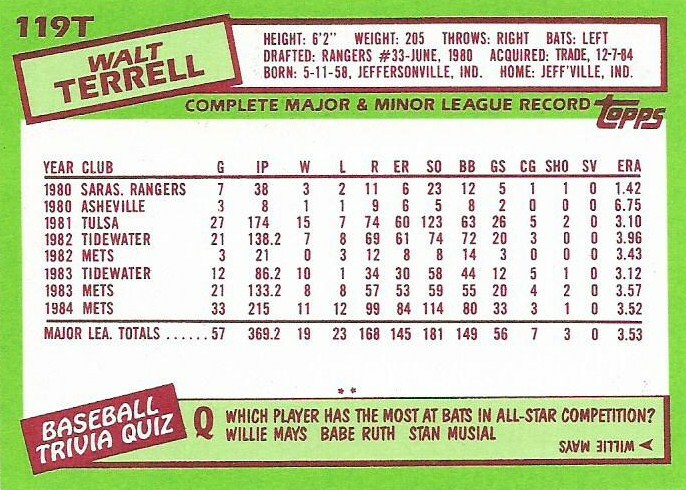 Backatya: Fernando Valenzuela tied the rookie shutout record set by Ewell Russell of the 1913 Chicago White Sox. 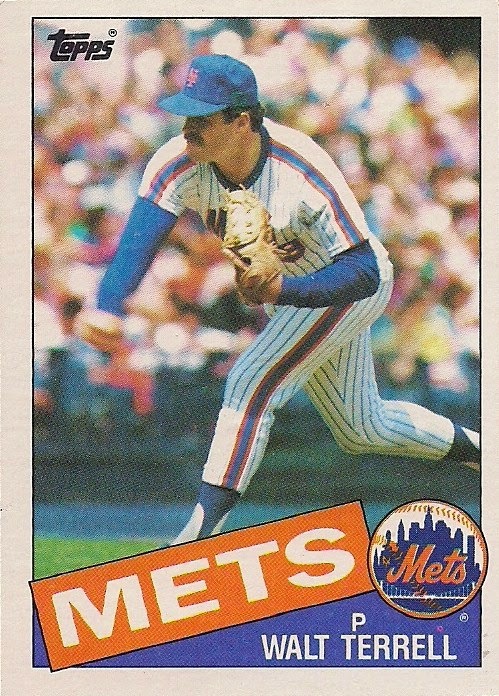 Valenzuela's feat is all the more amazing considering he accomplished it during a strike-shortened season. 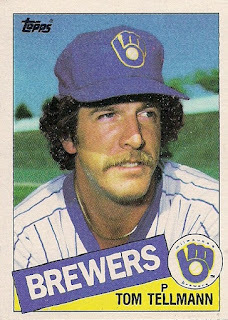 Back-to-back: You be the judge: Tellmann's Traded card is better because that hairstyle is best viewed at a distance or Tellmann's flagship card is better because of the mustache significance. The flagship card is No. 112 in the set and was originally blogged on Nov. 8, 2012. The blog wants to speak now: How about that? The last post I didn't know when I'd get back to this blog and now I post on the regular pattern! I don't know if I'll keep this up though. We'll see. 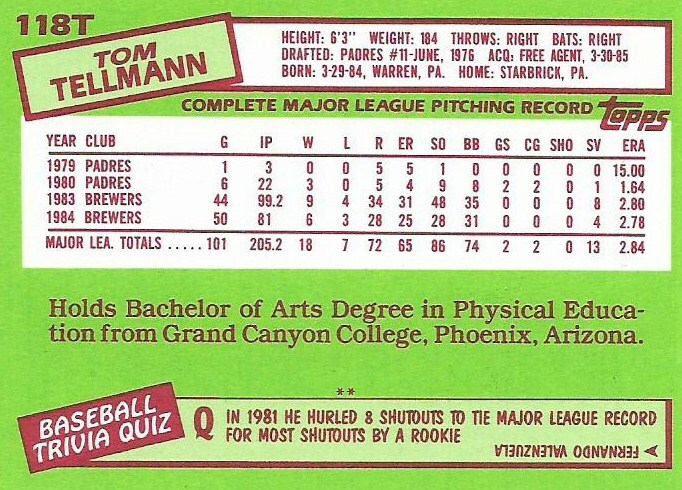 Also on the good side, I caught my spelling mistakes on Tellmann's name on the original post. 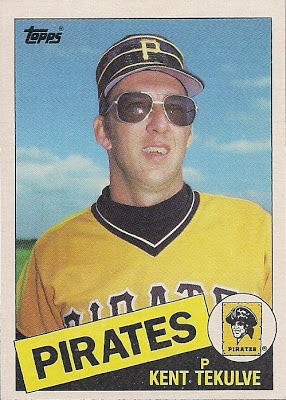 What a card: Kent Tekulve parted with the Pirates when Pittsburgh traded him to Philadelphia for pitcher Al Holland and a minor leaguer on April 20, 1985. How'd that go: Tekulve enjoyed four more years of successful relieving with the Phillies, although the save rate went way down. 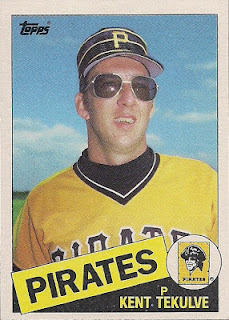 Backatya: Tekulve completed his career with the Reds, which was his hometown team. 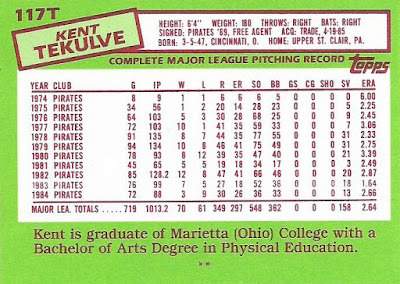 Back-to-back: Two Kent Tekulve cards back-to-back is a whole lot of fun. I prefer the flagship card (No. 125 in the set and originally blogged on Dec. 17, 2012), but the traded one is cool, too. That's a nice look at old Veterans Stadium with the Marlboro sign in the distance. The blog wants to speak now: Unfortunately, this blog will be taking a break for a little bit. I'm not sure how long. Could be a few days, could be a couple weeks. But we'll get back at it for the grand finish. What a card: Don Sutton was dealt to the A's in a trade on Dec. 7, 1984. 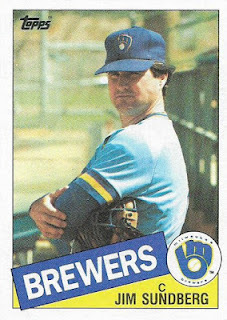 The Brewers sent Sutton to Oakland for pitcher Ray Burris and a player to be named, minor-leaguer Ed Myers. How'd that go: In Sutton's only season for Oakland in 1985, he won in double figures (again) at 13-8 and pitched closed to 200 innings (again). 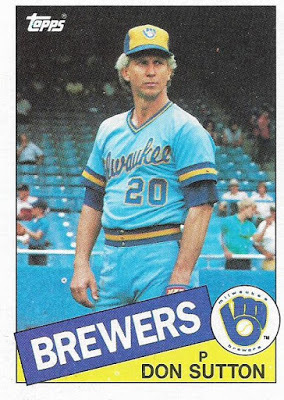 He was traded to the Angels in September of that year. Backatya: You can tell by Sutton's birthdate that he pitched for Oakland when he was 40. 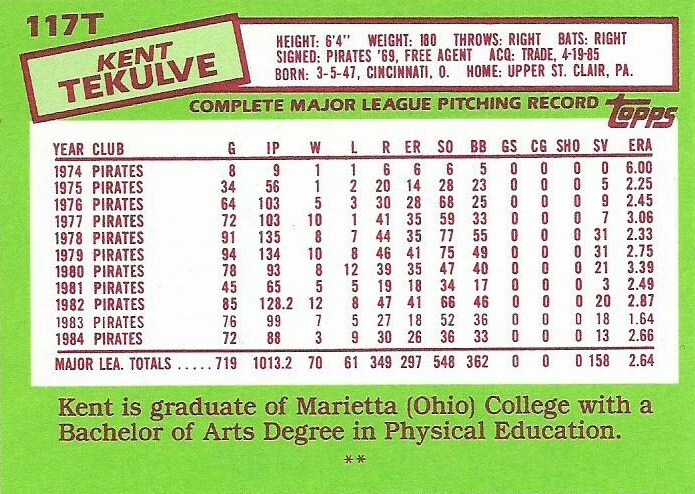 He did pretty well for himself in his early 40s. Back-to-back: Two candid shots in what may or may not be the same ballpark. The flagship card is No. 729 in the set and was originally blogged on Nov. 28, 2017. The blog wants to speak now: The TV category is updated. What a card: Bruce Sutter signed as a free agent with the Braves on Dec. 7, 1984, cashing his chips after setting the National League record (and tying the overall record) for saves in a season with 45 with the Cardinals. 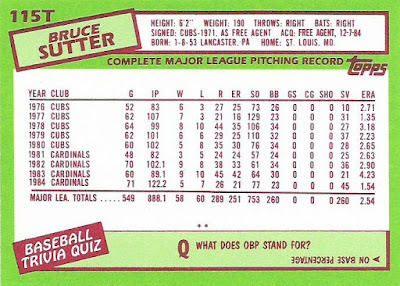 How'd that go: Sutter started off OK for the Braves in '85 but the team was far from the Cardinals at that time and he managed just half of the save total he had in St. Louis with 23 and the ERA ballooned to 4. 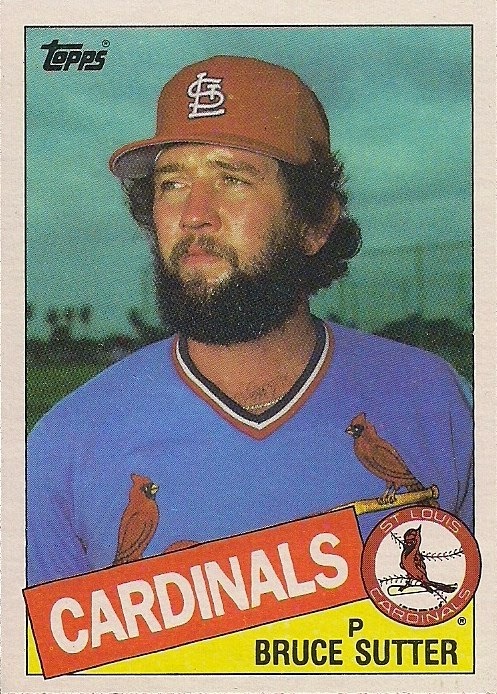 After that injuries took their toll and Sutter was never the same as he was with the Cubs and Cardinals. 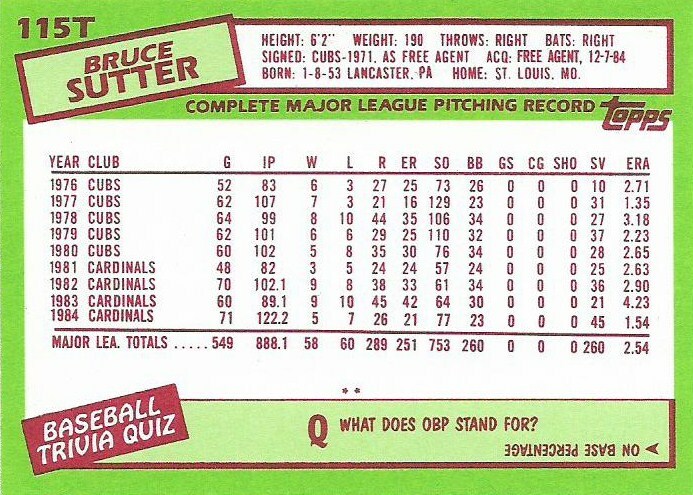 Backatya: Pretty impressive that Sutter never pitched in fewer than 48 games in a season up to this point. Back-to-back: The Sutter Traded card is the fourth card of Sutter in Topps' flagship and Traded sets. The Braves Sutter card stands out, not only because of the different uniform but because the other three are remarkably similar. The flagship Sutter is No. 370 in the set and was originally blogged on Jan. 19, 2015. The blog wants to speak now: The Movies category is updated. 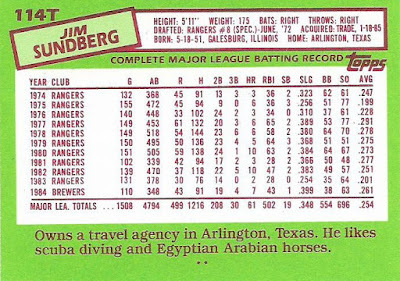 What a card: Jim Sundberg came to the Royals in the big four-team trade involving the Brewers, Mets, Royals and Rangers on Jan. 18, 1985. It was Sundberg's part of the deal (the Royals shipped catcher Don Slaught to the Rangers) that had an effect on the postseason that year. How'd that go: According to plan. 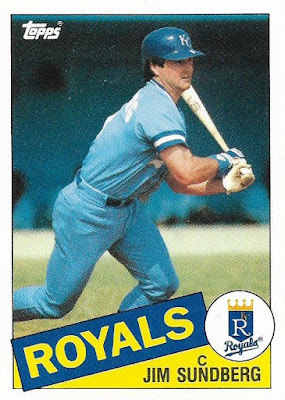 The Royals acquired Sundberg, known for years for his defensive ability, to handle a talented-but-young pitching staff. Sundberg played 115 games for the Royals in 1985 and K.C. 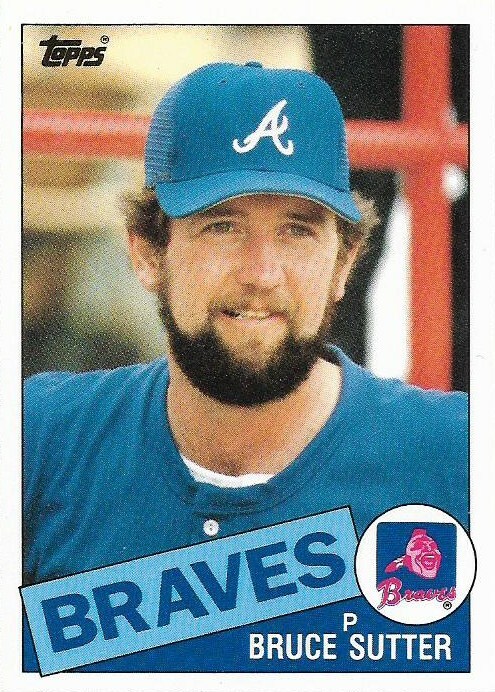 's pitching staff went all the way to the World Series and hurler Bret Saberhagen became a star. 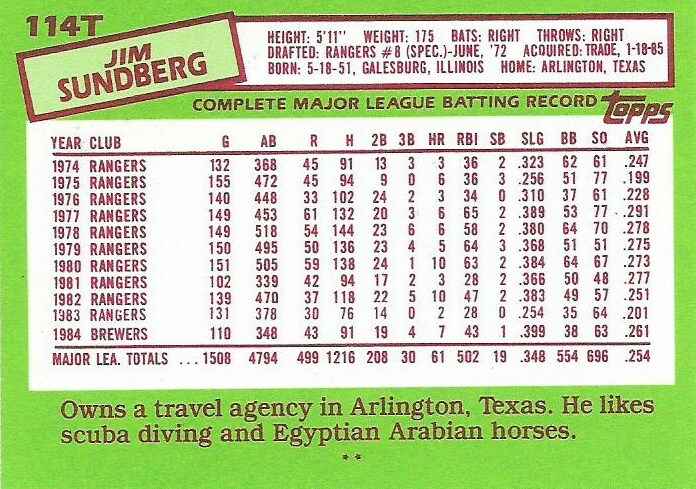 Sundberg added a few key postseason hits, too. His three-run triple in Game 7 of the ALCS against the Blue Jays was the big blow. Backatya: It's often difficult to find confirmation of some of the baseball card info about hobbies. 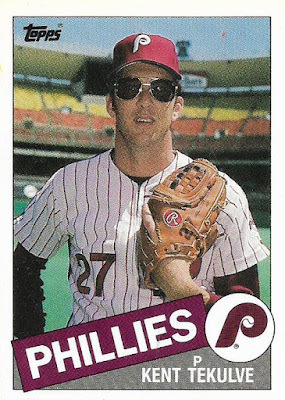 Sometimes I think the players make them up to goof on Topps. Back-to-back: These cards are very much alike in color scheme both in design and uniform. The flagship card is No. 446 in the set and was originally blogged on Aug. 28, 2015.